Cherry Consulting Network strives to promote, educate, and network within the virtual business community as well as the real life business community. 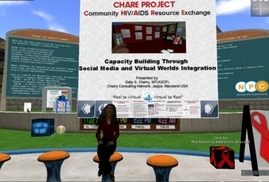 Through our "Real to Virtual" marketing program, real life nonprofit, business, and faith-based programs and services are promoted within relevant virtual world communities. We offer linkage to capacity building services, skill building resources, technical assistance, social media tools, books, seminars, training classes, and even affordable promotional cards. Cherry Consulting Network employs a diverse social media toolkit for our real life and virtual-based marketing program ("Real to Virtual;..."). It is important that the construction of an effective Social Media Toolkit is based on the targeted audience, organizational mission, and message type. Our Toolkit includes Linkedin, Twitter, Facebook Business Pages, Pinterest, Blogger, and other relevant tools. 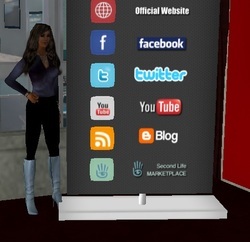 With the opening of Kitely Market, a virtual-based e-commerce site known as SarVonne Creations Etc was added to our "Real to Virtual; Virtual to Real" marketing plan. It provides a venue for the in-world, multi-grid sale of 3D virtual content created and services provided by the Cherry Consulting Network consultants. 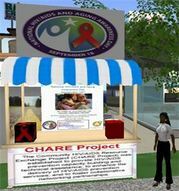 In observance of National HIV/AIDS and Aging Awareness Day (NHAAAD) and World AIDS Day, Sally S. Cherry, MT(ASCP) via the SL avatar, SarVana Haalan presented at the virtual-based 4th Anniversary of Nonprofit Commons in Second Life (NPC) event and a weekly NPC meeting.